Take your Catan game over the horizon and discover a life of island adventure with Catan: Explorers and Pirates! The five scenarios in this set require you to master not one island but three, and the sea as well! With a wealth of new pieces, rules and options, Klaus Teuber’s masterpiece is more compelling than ever! Explore and trade with ships designed to carry settlers, cargo or adventurers. Settle new lands, battle pirates, acquire spices and locate the grand banks of Catanian fish! The Catan: Explorers and Pirates expansion features five scenarios and three missions. Some of the scenarios make use of the missions while others do not, allowing you to mix and match for maximum variety and replayability. Land Ho! (Introductory Scenario) - Explore the seas of Catan and discover two new islands to expand your settlements. Once you’ve discovered an island, you must use ships to ferry settlers from one island to another and colonize distant lands. Pirate Lairs! (One Mission Scenario) - In this scenario pirates prowl the seas along with your trading vessels. Pay tribute to the pirates or drive them off. Then find and capture their lairs to earn gold and Victory Points! Fish For Catan! (Two Mission Scenario) - The people of Catan are short of food! These are deep water fish though, so first you must find their shoals before you can catch them! The Council of Catan will reward players with Victory Points for returning fish to the island, as well as for capturing pirate lairs. Just watch out for roaming pirates, not only will they demand gold for tribute, they might also get to the fish before you do! Spices For Catan! (Two Mission Scenario) - In this scenario the Council of Catan wants you to find fish and spices for the people of Catan! As before, they reward the most industrious merchant captains with victory points. Obtaining spice will require you to become friends with the mysterious inhabitants of the Spice Islands but in return they will not only trade you spices but teach you their knowledge of sailing or even pirate fighting techniques! Explorers and Pirates! (Three Mission Scenario) - This lengthy and challenging scenario brings everything from the previous scenarios together! Explore new lands, capture pirate lairs, find fish and befriend the inhabitants of the spice isles! Opens up many more options,and is much more fun than even the original! A must play with your family! The only drawback is that it can be confusing at first and the initial setup is time consuming. Take the time to split up all the peices into the bags as instructed. Play the quests in order, but after that, you’ll want to play the last (or biggest) quest over and over! I have also found that limiting the points to win at the start of the game can be very beneficial with this board game as my girls and I have spent over two hours playing this one! Yes, it is that much fun, but sometimes you have to get the little ones to bed. Check online for helpful videos and don’t give up. It’s worth it! 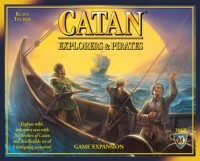 Add a Review for "Catan: Explorers & Pirates"